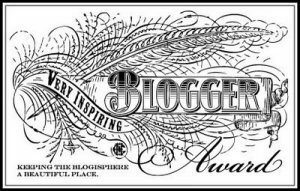 Thea Christie from Disciples of Art has kindly given me my second Very Inspiring Blogger Award! A big thank you to her – it’s very much appreciated. Be sure to check out her post here. Post the award image to your page. Nominate other blogs and inform them about it. I include Alien, Singin’ in the Rain, and Kill Bill amongst my absolute favourite films. I became far too obsessed with Donnie Darko as a teenager, spending what seems like days pouring over and over different interpretations. Jane Austen is my favourite author, closely followed by several others including Dave Eggers, Angela Carter, and Virginia Woolf. I’m a huge fan of the Fallout series, dedicating far too many hours/days to it! I watched Don’t Look Now for the first time last night and can’t shake it out of my head. It’s already one of my favourite horror films and is seriously evocative! Last year I went whale watching and ended up having a humpback whale come up right next to the boat. A truly awesome moment. Being a lifelong Bond fan, I decided as a kid that I should contact MI6 and offer my services as a young spy. Strangely, I didn’t receive an answer. Congrats! Interesting facts you’ve shared here, James! Nice picks ffor your favorite films, too. Thanks very much for the nomination! Hey, thanks so much for the nomination, much appreciated. Have you figured out Donnie Darko yet?? Haha, I think I did once. It was so long ago that I now can’t remember the details of my theory! Do you have any ideas? Absolutely none. I love the film and after about the fourth time watching it I just gave up and enjoyed it for what it was. It is quite compelling though. Perhaps that’s the best way to enjoy the film! I bought the directors cut recently (which I prefer) and it has a decent amount of bonus features. I may take a look through them soon and see if anything interesting turns up. Haha, thanks! Whale watching is fantastic, but it did present an… interesting moment when I realised just how much smaller the boat was than the whale that was alongside it! Congrats! Nice to hear Jane Austen is your fave author. I love her books and film adaptations! Thanks Ruth! Do you know which one is your favourite? I have to go for the predictible one, Pride and Prejudice 😀 That’s both the book and the Firth adaptation. Some nice facts you shared there! The last one was cute 🙂 Congrats for the award!